Photo above: On 10 June 1914 James Muir WATSON married Agnes (Nancy) Elizabeth ACTON. For those interested in Watson family history the above photograph is unique because it shows the complete Thomas and Jane (MUIR) Watson family at one time and in one place. 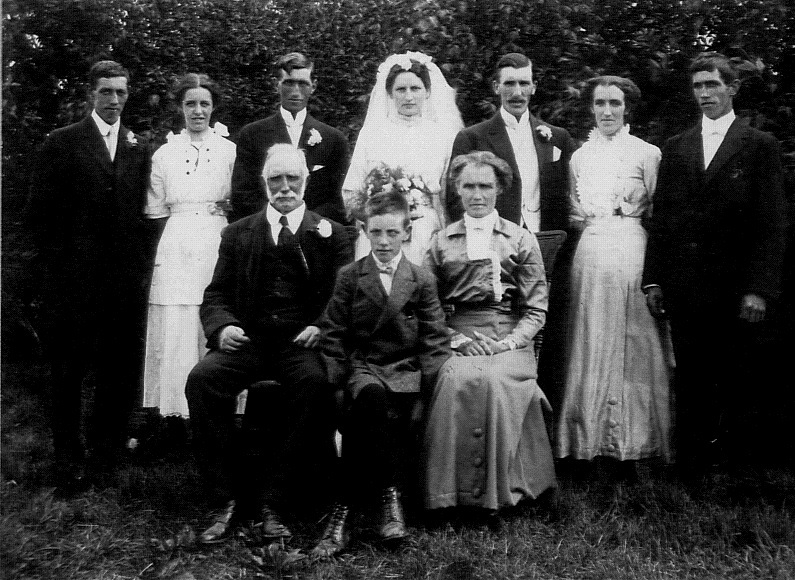 Standing, left to right: Alexander Hunter WATSON, Jane (‘Jean’) Muir WATSON, the groom James (‘Jim’) Muir WATSON and his bride Agnes (Nancy) Elizabeth ACTON, Thomas (‘Tom’) WATSON, Helen (‘Nell’) McNab WATSON and William (‘Bill’) Watson Muir WATSON. Sitting: father Thomas (‘Tom’) WATSON and his wife Jane (‘Jean’) MUIR, and between them their youngest child John McConnell Muir WATSON. The only family member missing is Mary Hunter WATSON who died as a young child in Scotland in 1900. The date of the wedding is 10 June 1914, the place is the bride’s home on her parent’s (Samuel ACTON and Janet WALKER) farm in Rosewood, Saskatchewan. L to R: Parents of the groom, Thomas Watson and his wife Jane Watson, groom James (Jim) Watson, bride Agnes (Nancy) Watson and parents of the bride Janet and Samuel Acton. The photograph was taken in the vegetable garden – see the sticks with seed package covers to mark the rows in the lower left of the photo. A clipping from a local newspaper [probably the Lemberg Star, however no source was cited] described the wedding. On Wednesday of last week one of the most popular young ladies in the district, Miss Nancy Acton, entered into the married estate, the happy bridegroom being Mr. James Watson, second son of Mr. and Mrs. Thomas Watson who, since they came out from Scotland some four years ago, have been farming north of the [Qu’Appelle] valley. The wedding took place at the beautiful home of the bride’s father, Mr. S. [Samuel] Acton. Right: The home of Samuel and Janet Acton, obviously several years before the veranda was built, and tree windbreak and garden planted. A large company of friends and neighbors gathered on the veranda of the house which was gaily festooned with branches of trees, with the guests grouped around on the lawn. Rev. 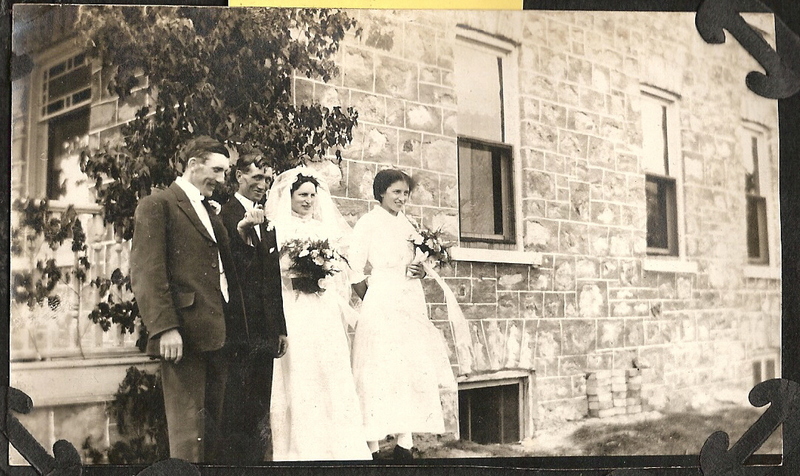 D. B. Millard officiated, Mr. Thos Watson, of Winnipeg, brother of the bridegroom, acted as best man, Miss May Acton supported her sister as bridesmaid and Mrs. W. S. Oliver played the wedding march and accompanied the singing. The bride looked lovely in a gown of lace over white satin, with a prettily embroidered veil fastened to her hair with a wreath of white carnations, a bouquet of which she also carried in her hand. The bridesmaid was becomingly dressed in embroidered voile with a pink sash and pink carnations. Left to right: Thomas WATSON, and his brother James WATSON, Agnes (Nancy) WATSON and her sister Sarah May (May) ACTON. The veranda of the house “gaily festooned with branches of trees” clearly in view. After the ceremony a sumptuous wedding breakfast was served on prettily decorated tables set out on the lawn under arches of trees and shade with foliage. Many useful and handsome wedding presents were showered on the bride, including a gold watch and chain from the bridegroom and a cheque from Rosewood congregation, where for several years past she has acted as organist. The bridegroom’s present to the bridesmaid was a gold bracelet. Amid a shower of rice and confetti the happy couple, the bride attired in a suit of Alice blue and a white hat, left by automobile for Wolseley en route for a short honeymoon in Regina. The newly married couple were driven to Wolseley to catch the train to Regina by the groom’s brother and best man Thomas who was a chauffeur in Winnipeg to the wealthy Black family. The bride, Nancy, later told her family that this was her first automobile ride.